Designed to sip and feel the same as the glass pints in your neighborhood pub. Enjoy the first sip to the last drop. 16 oz True Pint is rated 4.7 out of 5 by 107. Rated 5 out of 5 by Rodger from Love it! The perfect drinking vessel. Our cabinet at home is filled with them. I love how they stack so easily. Rated 5 out of 5 by purplesheep from Our New Daily Drinkware We are big fans of Hydroflask. We have the quart and 18oz flasks, which are great for hiking and biking, we take them everywhere. We were on the hunt for new drinking cups for our daily use at home. We are a color coding family, so having a different color for each person is great and less washing during the day with three kids. We have 10 different colors and it's wonderful. We did away with all of our glass drinking cups and don't regret it a bit. I love that they don't sweat, so no more need for placemats at dinner. I really like it for my morning tea as it stays warm longer than a mug. For my kids it's been great, especially if my little one decides not to drink all of his milk and forgets to put it in the refrigerator. It stays cool and I don't have to worry about it going to waste, in a short about of time. We believe only one thing could make this great product even better... a lid. A lid would help make them spill proof for the most part and it would also keep unwanted pests from flying into them while outdoors. Unfortunately there are not any lids for these pint cups. Please consider making lids for these terrific cups. Thank you for making great products! Rated 5 out of 5 by Nathalie from Keeps my drinks cold. I purchased this to cold and hot drinks. I love it for cold drinks, I don't drink beer but love water and juice in here. Happy overall. Rated 5 out of 5 by Msierra2 from Great new color in the true pint size Love the watermelon color in the true pint size. Please make all the new colors in the pint size. Complete the Rainbow! Rated 5 out of 5 by Gman808 from Perfect beer pint Excellent because it insulates and does not sweat. Rated 5 out of 5 by GShell from No Red...Seriously??? It’s hard to imagine you wouldn’t replace the old ‘Lava’ with another version of red. I was looking forward to another red. Pink just won’t cut it. Rated 5 out of 5 by Tiffanyyy from Skeptical at first. I bought this worried it wasn't going to work as well as my other coffee tumbles or many water bottles cause it had no lid, but I am so impressed and surprised that after 15 hours there was still ice in it. This is now probably my favorite Hydro Flask product next to my water bottle. Rated 5 out of 5 by Kenzie from Perfect size for holding and drinking from. I bought this right after Thanksgiving. I have had my morning coffee in it since I recived it. I finish my coffee before it gets cold, even when that may be 12 hours later. Rated 5 out of 5 by LisaMae from Great cup! Love this, keeps my drink super cold. I just with it had a lid or straw lid! Please make one! Rated 5 out of 5 by Rough Wood from Great Lip! So many products like this have a "sippy cup" feel. The True Pint is better than most glasses. Rated 5 out of 5 by JackieGA from So worth the price! Just wish it had a lid! That would make it perfect! Please make a lid! Rated 5 out of 5 by Ryanw from Keep it cold all day I had been using a glass cup at work on my desk for months until I was told about the true pint from Hydroflask. I decided to get one and try it out. It changed my life. My water sits on my desk for hours sometimes and I'll come back to it still being cold. If you're on the fence, do yourself a favor, just get one. Rated 5 out of 5 by Bergie from Great. Built-in 1 oz measure All the positives mentioned by others. The step in the bottom is a 1oz measure. This makes it easy to mix a cocktail. I can’t believe they don’t mention this as a feature. Rated 5 out of 5 by Jaco from Needs sip lid to consume hot coffee in car. I cannot believe you do not sell lids for the True 12 oz. and 16 oz. cups. 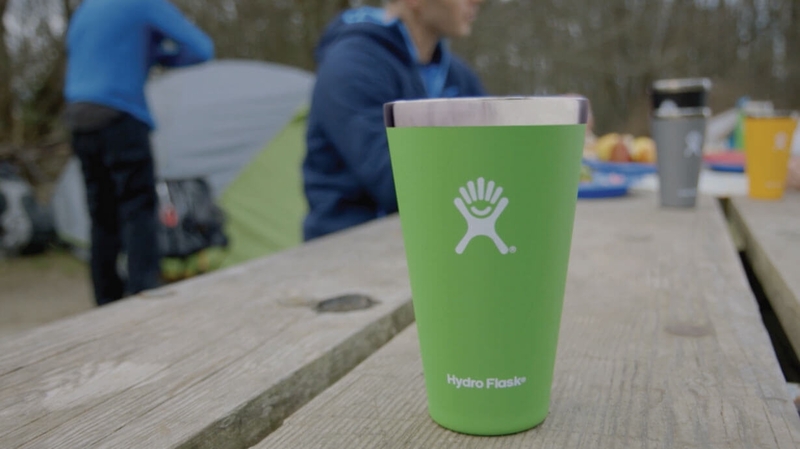 Hydro Flask could be dominating the gargantuan market for hot coffee mugs in cars! Rated 5 out of 5 by Game On from Love my two! My brother gave me two a small one and a large and I use them both constantly! Rated 5 out of 5 by kc2lpp from Amazing!! I got a Black 16 oz "True Pint" and it keeps all my drinks cold as ice!! Rated 5 out of 5 by megster from Love my cup but wish there was a lid option! I love my pint cup, it keeps beer frosty and my coffee warm. My only complaint is I wish they had a lid comparable for it! Please please pleaseeeeee make one! Rated 5 out of 5 by akluc873 from The best cup ever I purchased one from a Street Pub event and it's literally the best thing ever. Keeps ice in my drink for like 3-4 hours, while my friends drinks (in glasses) were all melted within the hour! Rated 5 out of 5 by KC Woody from Bomber insulation meets a thin lip! It goes without saying that these true pints insulate well just like other HF products (and many others). To me the differentiator is in the experience beyond the cold or hot beverage. This cup feels like a pint glass in every way but is BETTER. It is light in the hand. The textured surface ensures a solid grip. It is the ONLY insulated cup that I am aware of that is stackable. this is a huge advantage when space matters whether it be a small kitchen or tote bag filled for a picnic or day at the park. The single greatest feature in my opinion is that the lip of the TRUE PINT is THIN! Other insulated cups are chunky. Drinking from this cup is better than a regular pint glass. I would liken it more to a pilsner glass or maybe an average wine glass. The tactile experience of True Pint is true perfection. I DO believe they should make a lid for those that want it. I would likely buy one for the versatility, but I also have HF tumblers and other brands with lids should the need arise. I will be getting more for certain. TIP: Clean coffee stains or deposits using a few denture cleaning tablets. works wonders! I keep pint glasses in the freezer to have a frosted mug. I understand the Hydro Flask pint glass is designed so that is not needed but can I still put the Hydro Flask in the freezer? Will the cold hurt it? I would love to give customized ones as gifts for my wedding. Do you have an option to add a name or something to them? I have one with a logo from Cadillac mountain sports which I think is awesome but I a guessing it might have been done afterwards? Is the true 16 oz. true pint dishwasher safe? Are you going to give in to customer requests and develop a lid for the 16 ounce tumblers, or just in effect encourage us to try a different brand? We do have out Flamingo color coming out this spring for select products but it doesn't look like the True Pint is on of them. :( Keep an eye on our website for its release. I am sure we will have something awesome for you in that color instead! Please, pretty please, develop a lid for this awesome tumbler! It would make this vessel more versatile and much more conducive to on-the-go occasions. Please make a Cap for the true pint! Is the true pint dishwasher safe? Will this work with a tumbler lid? Or any lid? We do not currently manufacture a cap for the True Pint. It was specifically designed to be an open vessel, like a glass pint versus a tumbler.